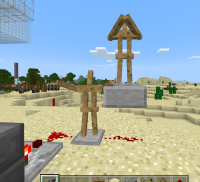 Armour stands are supposed to be able to change their pose according to the strength of redstone power they are receiving. This feature doesn't seem to be working. It should react, and change it's pose based on the strength of the signal it receives. You can also choose poses using incoming redstone power Pretty cool for automation!